Microscopes and Cameras sales for educational institutions, hospitals, laboratories, industrial and home use. 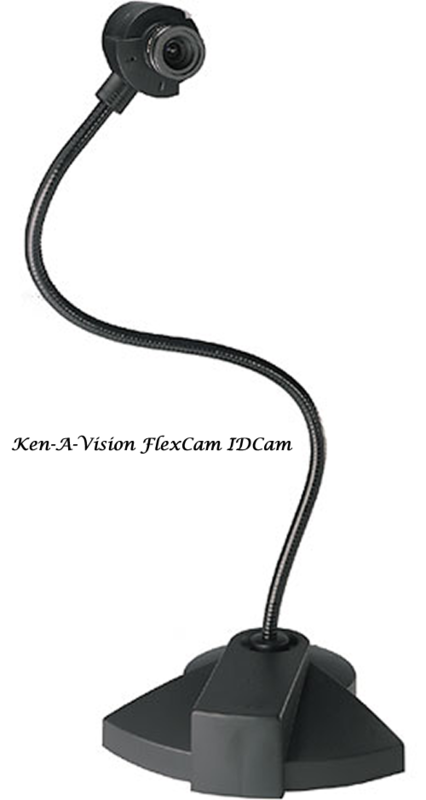 The FlexCam iCam Digital from Ken-A-Vision is an economical and versatile camera that is well suited for a variety of tasks. Present objects, images, or text. Send video e-mail or create video portfolios. 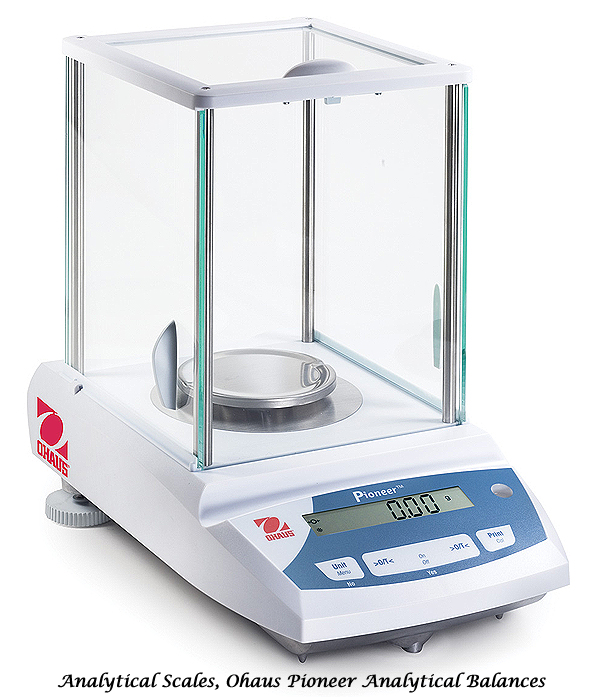 This unit is also perfect for viewing microscopic images by using its integrated focus knob and included microscope adapters. The unit includes a solid base and a flexible arm with the camera mounted at its end. Bend and twist the arm to perfectly position the camera to meet your needs. It can be connected to a PC, Mac, television, VCR, or LCD projector. Also included is ArcSoft Video Impression Photo Studio software to facilitate image & video capture and editing. With its ability to record images, video, and microscopic shots (with the use of included adapters), this unit is well suited for a wide variety of applications. The unit includes a solid base and a flexible arm with the camera mounted at its end. Bend and twist the arm to perfectly position the camera to meet your needs. This camera can be connected to a PC, Mac, television, VCR, or LCD projector. • Also included is ArcSoft Video Impression Photo Studio software to facilitate image & video capture and editing. The Videolabs StudentCam is a full-motion color camera that provides sharp video images to TVs, monitors and projectors. With the USB adapter (sold separately) the camera can also connect to computers for display or editing. The camera integrates an 8 mm lens that can focus as close as 1/4-inch. The unit comes with an S-Video/Audio cable, a composite video adapter, microscope couplers, and power supply. The StudentCam plugs directly into standard 110 Volt wall outlet with its included power transformer. The camera is on a almost infinitely flexible goose-neck and can be aimed in most any direction. Objects, flat art, text and audio can be displayed clearly on TVs, monitors or video projectors. S-video/audio cable and composite video adapters are included. The lens on the camera is an 8 mm that provides a 31° horizontal angle of view. But more important to presentation requirements the lens can focus as close as 1¼ inch (6.35 mm) from an object. The 20-inch goose-neck allows the camera to be aimed at almost anything, from tabletop text to wall mounted maps or even the speaker themselves. The camera comes with a microscope coupler that allows microscope adapters to be attached to the camera. Adapters are sold for specific microscopes and must be purchased separately. 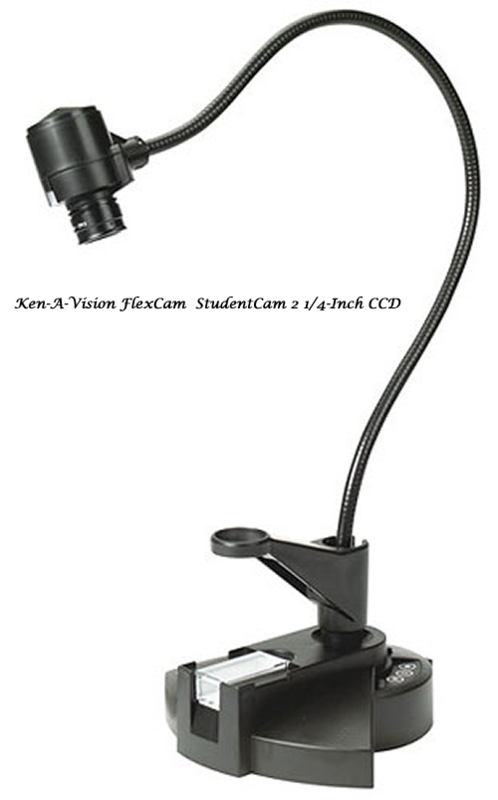 The Videolabs/ClearOne IDCam is an educational presentation camera with an eighteen inch flexible gooseneck. The positionable head can swivel 60° and it has 16 mm C-mount lens. 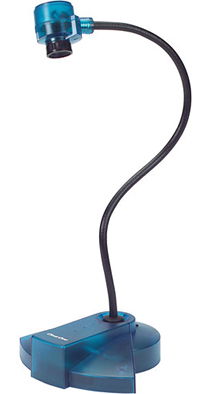 With the gooseneck and swivel head the camera can be precisely positioned for proper framing between four to eight feet. Photo ID card creation is one of the obvious applications but the camera can focus from 11 inches to 50 feet which opens up the IDCam to a wide range of uses. Flexible 18-inch gooseneck, 60° swivel head and 16mm C-Mount lens make it possible to precisely position the camera for proper head and shoulder framing between 4 and 8 feet. Additional lenses are available for custom applications which require imaging from a range of distances and scene sizes. Two-button Iris Control System (ICS) adjusts to any lighting environment. With ICS the IDCam can be integrated into an ID badging system without the need for an external flash. There is a simple to use two-button brightness control on the base of the unit. Perfect for use at any receptionist desk that would benefit from an inexpensive and effective security system. The IDCam can be used with either Windows or Macintosh systems. It has higher resolution S-Video output for fine quality images. It also has USB connectivity that will supply power and work with certain capture cards and display devices. 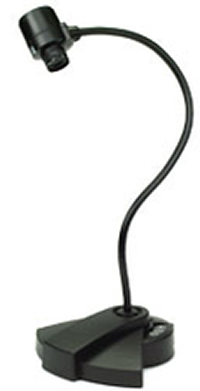 a built-in microphone allows the camera to be used for presentations and demonstrations. Lastly, the IDCam is both NTSC and PAL systems compatible. The Videolabs StudentCam 2 is a full-motion color camera that provides sharp video images to TVs, monitors and projectors. With the USB adapter (sold separately) the camera can also connect to computers for display or editing. The camera integrates an 8 mm lens that can focus as close as 1/4-inch. The unit comes with an S-Video/Audio cable, a composite video adapter, microscope couplers, and power supply.